Before :- J. S. Sekhon, J. For the Petitioners :- Sh. M.J.S Sethi, Sr. Advocate with Sh. Amit Sethi, Advocate. For the Respondent Nos. 1 and 2 :- Sh. Mahesh Grover, Advocate. For the State No. 3 :- Sh. Maharaj Kumar, Advocate. A. Indian Penal Code, Section 406 - Criminal Procedure Code, Section 181 - Birde married at Ludhiana but living at Panipat when, she demanded return of dowry Panipat Police and Court will have jurisdiction - Accused were required to return Stridhan at Panipat where bride was residing. B. Indian Penal Code, Section 498 A - Allegation of torture and cruelty - No date of Incident given in FIR - Allegations vague - Allegation that husband slapped his wife in presence of parents of wife not believed - FIR quashed. J. S. Sekhon, J. - Madhu Sharma and Meena Sharma, petitioners, mother-in-law and sister-in-law, respectively, of Smt. Savita Sharma have, invoked the inherent jurisdiction of this Court under the provisions of Section 482 of the Code of Criminal Procedure, 1973, for quashing first information report dated 19-1-1989 (Annexure P. 5) lodged against them by Dr. Murari Lal, father of the complainant at Police Station, City Panipat for offences under Sections 498-A, 406, 506 and 323 of the Indian Penal Code, inter alia, on the ground, of vagueness of the allegations and on the point of jurisdiction. "It is submitted that my daughter Savita Sharma, age 23 years, M.A. (English) was married according to Hindu custom on 14-12-1987 to Vikas Sharma son of late Shri B. K. Sharma, Civil Lines Ludhiana. At the time of marriage I spent about Rs. 1 lac on dowry (cash and jewellery and articles) and marriage expenses etc. My daughter left for her husband's house but Vikas Sharma, brother Anil Sharma, mother Smt. Madhu Sharma and her sister-in-law (Bhabhi) Meena Sharma started taunting her and troubling her on the pretext of bringing less dowry. In this connection my daughter wrote her first letter to me on 1-4-1988. After that I received two/three more letters saying that she is being harassed for bringing more cash. On 25-8-1988 Vikas Sharma, his mother and her sister-in-law (Bhabhi) came to Panipat alongwith Savita and demanded a sum of Rs. 50,000/- for Vikas's business. I told them that at the moment do not have the money. When I receive money on retirement, I shall help you in the business. But they threatened that if the money was not given right now they will not keep the girl in their house. They will trouble her and take her life. Vikas slapped my daughter on the face and threatened that they will force the girl to die. And left the girl at Panipat on 16-6-88 I, along with my brother Dr. Balram Sharma and my wife Sumitra Sharma took our daughter to their place at Ludhiana. I promised to give Rs. 50,000/- on retirement and left the girl at Ludhiana. But they continued to harass the girl for bringing more dowry. On 1-7-1988, I started getting the girl's letters again saying that her mother-in-law, sister-in-law, brotber-in-law and husband are harassing her for getting the amount of Rs. 50,000/-. They made plan to make my daughter a mental case and kept getting her intoxicating drugs from doctors. I received many letters from the girl. On 10-9-1988 1 got the last letter from the girl saying that her life is in danger. On 14-9-1988 Savita gave it in writing to the landlord Shri G. S. Sekhon that her life is in danger. He sent this letter to me. On this I went to their house in Ludhiana with my brother. Savita was in had shape. She said that her life is in danger. Her brother-in-law, sister-in-law, mother in-law and husband harass her for bringing more money, and do not let her go out of the house. On this I got my daughter back on 18-9-1988. I asked them to return the articles and cash given in dowry. But they refused and allowed the girl to go, only with her 'Mangalsutra' and some clothes with me. They kept all her jewellery with themselves. You are requested that a case be registered against my daughter's 'husband' Vikas Sharma, brother-in-law Anil Sharma, mother-in-law Smt. Madhu Sharma and sister-in-law Meena Sharma and legal action be taken. I will be highly obliged. Sd/- M. L. Sharma, 18-1-1989. 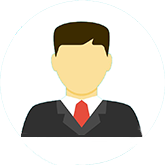 Medical Superintendent E.S.I. Hospital, Panipat." 3. In the return filed by the respondents, it is averred that the police and Court at Panipat had jurisdiction to investigate and try the above-referred case as hard cash amounting to Rs. 42,000/- for' the purchase of scooter, T. V. and refrigerator etc. was entrusted to the accused at Panipat. On merits of the case it is maintained that the allegations are specific and that the accused failed to return stridhan of Smt. Savita Sharma despite demand. 4. I have heard the learned counsel for the parties besides perusing the record. I touch your feet. We are well and wish you the same. My health is better to a large extent than before. That day Papa on suddenly seeing my condition got puzzled and lost his balance. For whatever happened that day I seek forgiveness from you. Mama, whatever might happen. I belong to that house. One is prone to many wrong actions when one is upset. I seek forgiveness for that. I also could not understand and what must be done due to my bad health. I hope that you would forgive your daughter and send for her on her quick recovery. Here everything is O. K. Haven Bahia (brother) and Bhabhi (sister-in-law) and how is Mehak and tell Mehak that her aunty remembers her a lot and get your chachi (aunty) back soon. Bhabhiji must be alright. Mama I was quite upset and you, please write to me soon. You also intimate me about the state of your health. Don't worry about me. I am better than before. Mama, Raju's daughter and she herself are alright. Whatever want me to do for that you send it per my husband or convey the same to me I have not yet given anything. Everything else is alright. I touch the feet of Bhaiya (brother) and Bhabhi and lots of love to Mehak. My health is better than before. I also got my E.C.G. done here. It is normal, there is slight problem with my chest for that I am taking medicines. I got my chest X-ray as well. Rest I am taking a proper diet. 'Your all don't worry about me. Whatever happened that day I feel sorry for that. As a matter Papa seeing my condition got upset, Our times are bad and that is why that in such a short period we had to face so much. I hope that you will forgive your Savita. Being upset. even I could not make out what to do. How are you ? Take care of yourself, get your check up done and take care of your health. Take proper diet. You make a tour of this side and take me from here. You' will have to take me back a few days before Anita's marriage as I have to make preparations for myself over there. Did you receive any letter from there or not ? On getting well I will write to them. How is Mehak ? How are Bhaiya and Bhabhiji? Tell them I touch their feet. Give lot of love to Mehak. Everything else is alright. I am unable to write much as my hand is paining. Raju and Raju's daughter are alright over here. Whatever, You have to give her, you can ask Mummy and bring it along. I have not given anything. 5. A bare glance through these letters reveals that the father of Smt. Savita Sharma get puzzled and lost his balance on seeing her ailing condition and she thought forgiveness for this conduct from her mother-in-law and her husband as she belongs to their household and one is prone to many wrong things while being upset. Smt. Savita Sharma had further shown her anxiety regarding the health of her mother-in-law besides asking her husband to take care of his health by taking proper diet and getting himself examined. She had further shown her willingness to accompany her husband and reside with him at Ludhiana, besides urging that he should make his tour towards this side, i.e. Panipat and take her back at least a few days before Anita's marriage as she had to make preparations in this regard. She has further enquired into the well being of brother of her husband as well as the latter's wife and son Mehak. The above referred tenor of these letters support the version of the accused petitioners in this petition that Smt. Savita was suffering from some mental depression and she was being treated at Christian Medical College Hospital, Ludhiana, when her father all of a sudden arrived there and took her along to Panipat after creating an ugly scene. If that is so, then the allegations in the first information report lodged by Dr. Murari Lal, father of Smt. Savita that the accused had tortured his daughter and, turned her out as she failed to fulfil the demand of her husband and in laws for Rs. 50,000/- for starting business are not well founded. On the other hand, it appears that when the relations between the father of Smt. Savita Sharma and her in-laws got strained and the husband had initiated proceedings in the Court at Ludhiana for dissolution of marriage by divorce, Dr. Murari Lal Sharma had resorted to registration of this case against his son-in-law and the latter's entire family probably in order to pressurise them to rehabilitate his daughter. 6. The matter does not test here as the allegations in the first information report regarding torture or cruelty, are vague as no date of any such, incident figures therein. There is no allegation against the present petitioners that they had exhorted their co-accused Vikas Sharma to slap his wife Smt. Savita Sharma besides threatening to kill her if she failed to bring. Rs. 50,000/- from her parents. Moreover, it looks too preposterous to believe that the husband will slap his wife in her parents' house at Panipat and in the presence of her parents. Thus, under these circumstances, Smt. Madhu Sharma, mother-in-law and Smt. Meena Sharma, sister-in-law of Smt. Savita Sharma are not even ex-facie liable for the offences under Sections 498-A, 506 or 323 IPC. 7. Regarding misappropriation of stridhan by these two accused petitioners, it transpires that the marriage between the parties admittedly took place at Ludhiana where the husband and in-laws of Smt. Savita also reside whereas her parents were then residing somewhere in the State of Haryana. There is no specific averment in the FIR that any of the articles of dowry or gifts were entrusted to a particular accused at the time of marriage. It is admitted case of the parties that most of the articles of dowry had since been returned to the father of Smt. Savita Sharma. 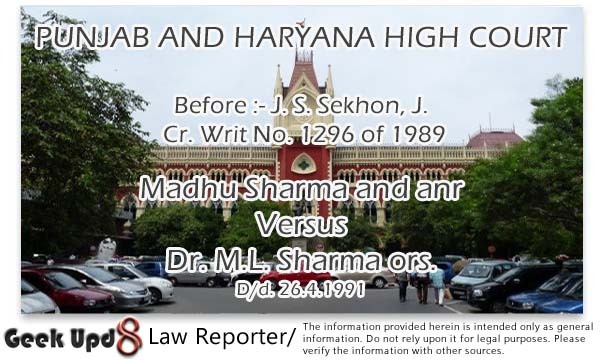 There is no specific averment in the first information report that Dr. Murari Lal had asked the two accused specifically to return the stridhan of his daughter except that he asked the accused to return the articles and cash but they refused to do so on 18-9-1988 when the took along his daughter from the house of her in-laws. 8. It is the admitted case of the parties that Vikas Sharma accused, husband of Smt. Savita Sharma is employed in some private company at Ludhiana. Thus, presumably the remaining articles forming part of her stridhan would remain in the custody of her husband unless it is specifically alleged that she handed over these articles to her mother-in-law or sister-in-law. There being no such specific assertion in the first information report, it cannot be said by any stretch of imagination that the mother-in-law or sister-in-law of Smt. Savita Sharma had retained her stridhan and refused to return the same on demand of her father. Thus, under these circumstances. the continuation of the investigation of the case or other proceedings resulting therefrom against the mother-in-law and sister-in-law of Smt. Savtia Sharma would amount to abuse of the process of investigation and trial. 9. On the point of territorial jurisdiction of the police or the Courts at Panipat to investigate or try the above referred offences. as the case may be, it transpires that at this stage the averments in the first information report are to be taken into consideration. In the first information report, it he specifically been averred that Smt. Savita Sharma, is at present residing with her parent, at panipat. The accused were required to return her stridhan at Panipat where she is at present residing. Moreover, there are allegations against the husband Vikas Sharma of slapping his wife and threatening to kill her in her parents house at Panipat if she failed to fetch Rs. 50,000/- from her father. Thus the offences. under Sections 323, 506 and 498-A, Indian Penal Code certainly took place at Panipat The bundle of facts constituting the above-referred offences and offence under Section 406 Indian Penal Code are so overlapping with each other that they form part of the same transaction. If that is so then according to the provisions of sub section (4) of Section 181 of the Code of Criminal Procedure, the Court where the property subject matter of criminal misappropriation or criminal breach of trust, was required to be returned would have jurisdiction to try this offence. 10. Consequently, there is no force in the contention of the petitioners that the police or Courts at Panipat, at the case may be, had no jurisdiction to investigate or try the above referred offences. 11. For the reasons recorded above, the impugned FIR Annexure P. 5 and other proceedings resulting 'therefrom qua Smt. Madhu Sharma and Smt. Meena Sharma petitioners only are ordered to be quashed by accepting this petition.